Pie Plates are a baker’s friend. Your kitchen needs to have a good all-purposeÂ pie plate that you can use for quiche, fruitÂ pies, custard pies, cakes (you can bake 8×8Â size cakes in a 9â€ pie dish also for somethingÂ different), impossible pies, the list goes on. There are all kinds of pie plates: glass, ceramic,Â metal, stoneware and silicone. A good all-around size is a 9â€ pie plate. It will fitÂ 95% of the recipes you will find. The most common one and probably the bestÂ known is the good olâ€™ glass pie pan by Pyrex. Since glass heats up slowly and spreads evenlyÂ the bottom crust comes out nice and crisp. apple pies. 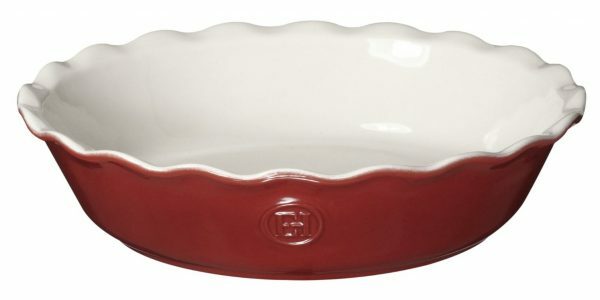 The deep dish can be recognized byÂ the scalloped edge. you. It also cleans up beautifully and will last forÂ many years. Companies like Chicago Metallic and USA PansÂ make very high quality aluminum pie plates. whatever pie my family is in the mood for.